Antirobe There are 4 products. Antirobe is an antibiotic made by Pfizer containing the active drug is Clindamycin. Antirobe interferes with the ability of the bacteria to produce certains proteins which are essential for them to survive. What can Antirobe be used for? 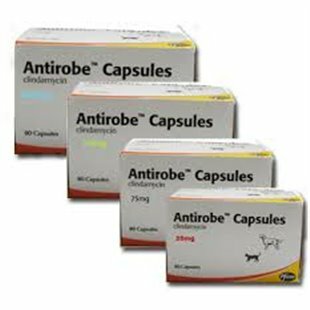 Antirobe is used in both dogs and cats primarily for abscesses, mouth infections and antibiotic cover for dental procedures. Antirobe can also be used to treat bone infections (osteomyelitis). Antirobe can also be used to treat skin infections in dogs. Antirobe is given orally in a capsule. The capsule can be given whole or opened and sprinkled onto food. Antirobe should not be given to small animals such as rabbits and guinea pigs as it can predispose to severe infections in the gut. Vomiting and diarrhoea have been seen after administration. If this happens, discontinue treatment and contact your vet.